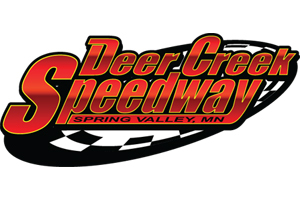 Spring Valley, MN (July 1) – By: Todd Narveson: Finally Mother Nature provided a picture perfect evening for racing at Deer Creek Speedway. 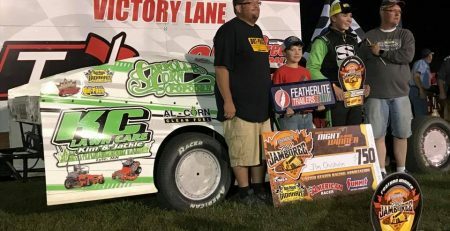 This week featured the Firecracker special with racing in all five divisions, school bus races and a huge fireworks display to end the program. This week’s event was presented by Trom Transport, Construction Partnership, BK Millright, Adams Graphix and Charlie’s Auto Repair. A huge crowd was on hand and a big field of 114-cars signed in to race. Two drivers would have huge nights when they scored their first career feature wins. The first feature race on the speedway was the National Fleet Graphics WISSOTA Midwest Modifieds. Steven Amundson and Casey Trom led the 21-car field to the green flag for their 18-lap race. A yellow halted the race on lap one and created a complete restart. Trom jumped to the lead, but eyes were on Nick Koehler who used the top groove to bolt from eighth to third on lap one. Koehler quickly swept past Amundson for second and started to reel in Trom. Robbie Franklin moved into the top five and passed Billy Steinberg to take fourth on the fifth circuit. Koehler challenged Trom for the lead on lap seven and made the pass in turn four to complete the lap. Franklin was up to third and brought Don Schaefer to fourth. Franklin then raced Trom for second with Schaefer and Steinberg right there. Two yellow flags on lap 8 and 11 tightened the pack for the restart. The green came out and Franklin along with Schaefer worked past Trom for second and third. Another yellow flag came out on lap 12 and set up a good race from there. Koehler led with Franklin and Schaefer close behind while Ryan Goergen was now fourth. Koehler hit the wall and Franklin drove by on lap 14. Koehler regained his composure and got his momentum back up to reel in Franklin. The Adams Graphix WISSOTA Street Stocks were 19-cars strong for their 18-lap feature race. Blake Adams, Steve Holthaus and Bernie Adams cycled three wide for the lead on lap one. Holthaus led lap one but Mike Blowers was on the fly from the ninth spot and was fourth after the first lap. The top three remained close and Blowers made it a four car battle up front. Blowers passed Noah Grinstead for third and then got past Blake Adams for second. Blowers was up alongside Holthaus for the lead on lap six. Blowers would take the lead one lap later and Adams was now second. Blowers led but Adams stayed close with the leader all the way to the end. Nick Schwebach got to the top five and was up to challenge Adams for second. That allowed Blowers to edge a little further ahead of the battle for second. Blowers got to the finish line first for his fourth win of the season. It was Blowers 33rd career win which puts him one behind Danny Hanson for thr all-time division lead. Adams edged Schwebach for second place. 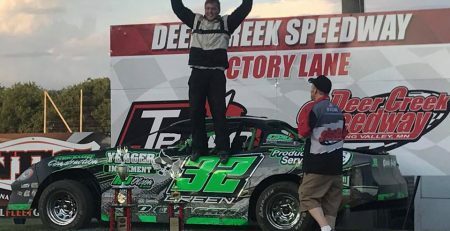 Danny Richards finished in the fourth position and rookie driver Braden Brauer got his second top five of the season. Brandon Hare and Nick Wagner led the 24-car field to the green in the Dirt Doctor Trucking USRA B-Mod feature. Hare took the early advantage with J.T. Wasmund to second and Wagner hung with the lead duo. Wasmund took the lead on lap two and Wagner worked to second. Wagner flew on the top side and took the lead from Wasmund on lap four. Kadden Kath drove to third and was close behind the leaders. Kath then raced Wasmund for second while Wagner extended his lead until lap 13 when the caution flag came out. Wagner took off on the restart and led the last five laps to score his first career win. Wagner also became the seventh different winner in seven weekly shows. Kath outdueled Wasmund for second place. Hare ended up in the fourth spot and Jim Chisholm finished in the fifth position. Ryan Schaufler got past pole sitter Kevin Hager to lead lap one of the Brauer Roofing Super Stock feature. A.J. Hoff started sixth and blasted around thop side of the track to lead lap two. Hoff took off from there and opened up a huge lead. Dan Nissalke took third while Neil Eckhart, Hager and Jeff Brauer were three abreast for fourth. Nissalke moved by Schaufler for second and Eckhart was third. Brauer also got past to fourth. Hoff checked out and led the caution free race to get his first career win. Nissalke would finish in second and Brauer got to third. Eckhart ended up in fourth and Tommy Richards would round out the top five. 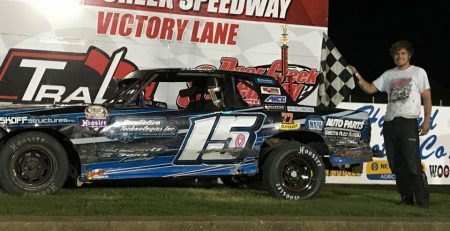 Six-time track champion Jason Cummins redrew the pole position for the 25-lap NAPA Auto Care Centers USRA Modified feature. 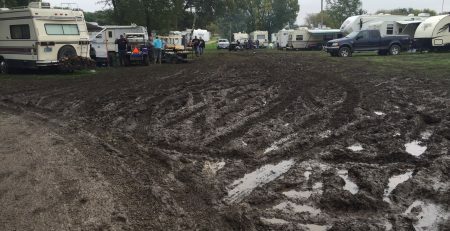 Jacob Dahle started on his outside when the field came to the green flag. Cummins scooted to the lead and opened up a big advantage early. Levi Nielsen got by Dahle for second and Lucas Schott challenged Dahle for third. Cummins was checked out up front when the leaders entered lapped traffic on lap 12. Cummins had a couple of issues with the lapped cars and Nielsen reeled him in. Nielsen was right with Cummins on lap 17 when the caution flag flew. That would give clear track for the pack on the restart and Cummins took full advantage of that. Cummins took off and Nielsen bounced off the wall that cost him a few positions. Schott was second and Dustin Sorensen was third. Jake Timm came from 14th and was into the top five. Cummins led the rest of the way for his fourth win of the season and ninth overall. Schott remained in second with Sorensen third. Timm got to fourth, but Brad Waits snuck past him on the final lap to take the spot away. Eight school buses ran a 10-lap feature to end the racing portion of the show. After an exciting battle with Chatfield and Goodhue It was Mike Hyland in the Kingsland bus who took the win. It was their fourth bus race win in a row. Flashing Thunder Fireworks and the Deer Creek Speedway then presented a huge fireworks display to end the night to celebrate the Fourth of July holiday. THE BIG 3 – The Showdown is Back! 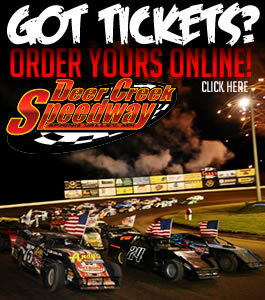 2016 Schedule – Tickets On Sale Now!! !